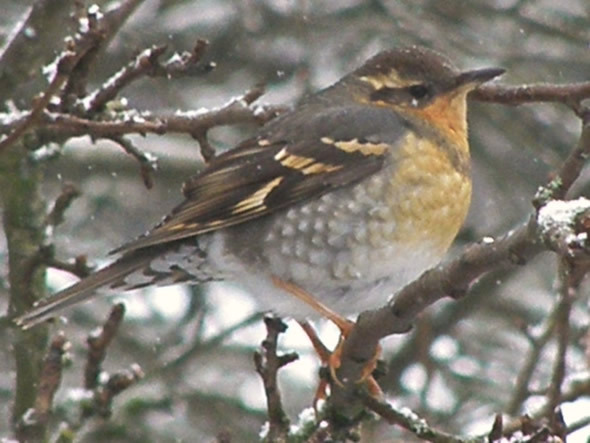 With the first signs of winter, this female Varied Thrush welcomes you to our November Newsletter. Which state changed its official tree in 1976 but changed it back in 1994? 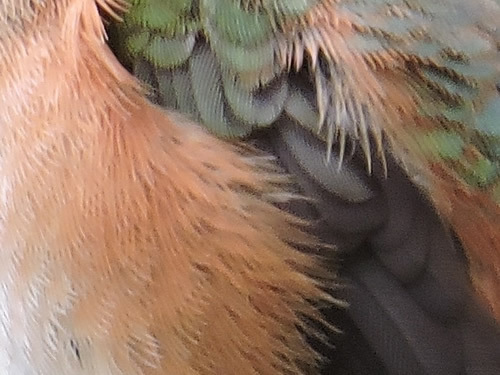 Alright, its a bird, but can you identify it? easily-made feeders in this section right here. 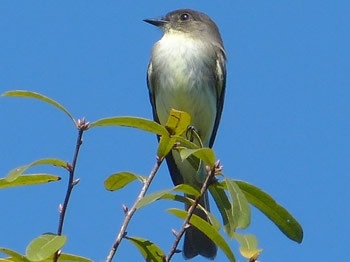 Marilyn Flanagan of Florida spotted this beautiful Eastern Phoebe. 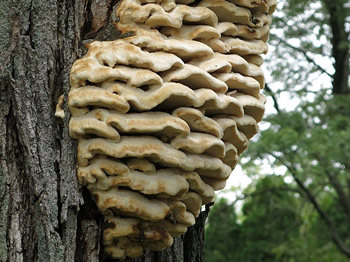 Susan Asis Kalman of Allegany, New York sent in this fascinating Shelf Fungus on a tree. 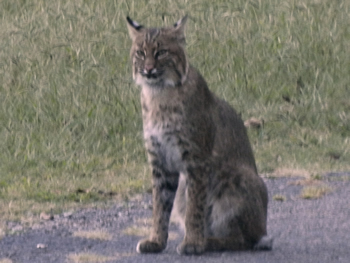 Joyce Cahill of Winslow in Arkansas had this bobcat rest on her driveway. Amazing! 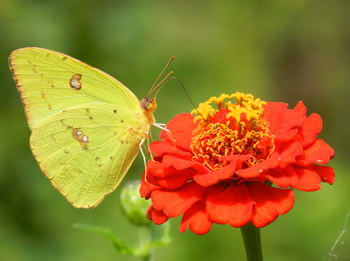 This colourful image of a yellow butterfly was also from Joyce. 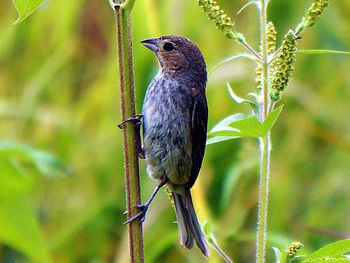 This lovely image of an Indigo Bunting is from Tracy Capps of Mascoutah, IL. 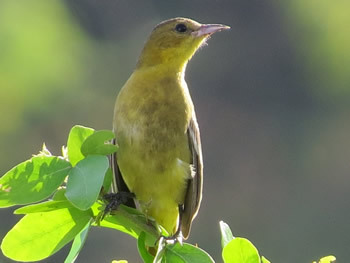 Tony in Toronto sent us this female Orchard Oriole. Many thanks to Marilyn, Susan, Joyce, Tracy and Tony for sending in all of these fantastic shots for us all to enjoy. They are wonderful! We came across a strange tree for this month's wandering image. 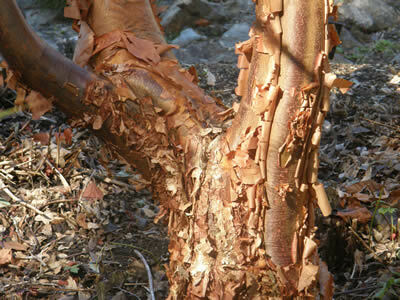 It's a Paperbark Maple. Its name seems to really suit it. #1 - "I can get to it if I stretch a bit. " #2 - "They could of moved it over a little for me. " 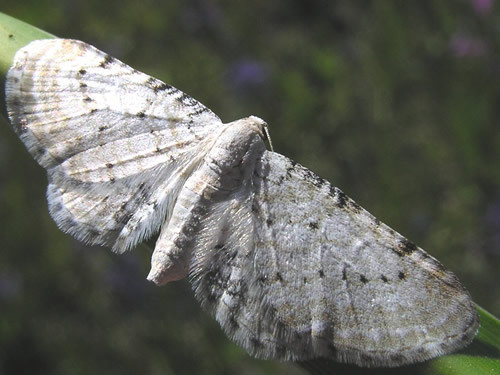 __A moth went into the doctor's office one day. __“What seems to be the problem?” asked the doctor. __“Where do I even begin?" replied the moth. 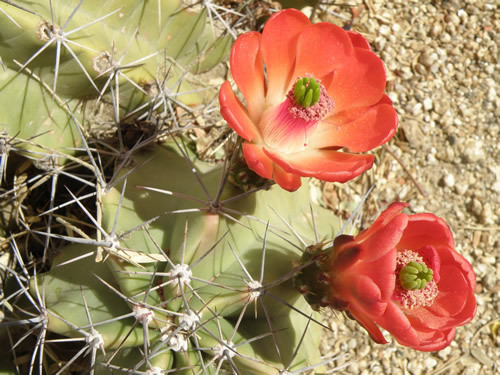 "I’m breaking my back day in and day out, working long, long hours fluttering around pollinating the flowers. Then I get home and my wife doesn't appreciate me and my kids are brats. Everything’s terrible! I really am at my wit’s end!" "I had a sit for a while anyway." Time to take a few berries out of the freezer and hang them up for the birds. 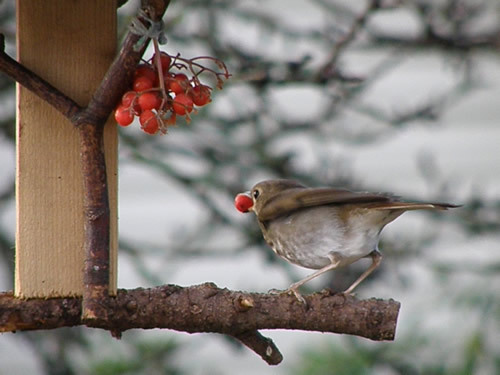 Here we have a Hermit Thrush having a snack. 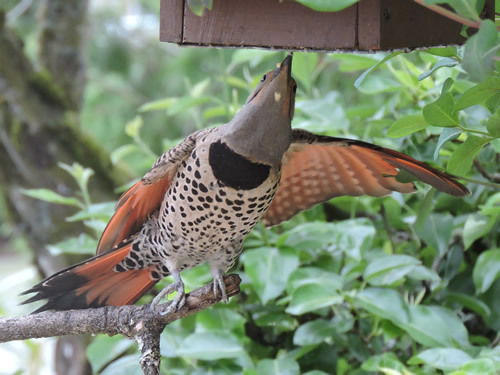 You can see how to make this cool berry feeder by clicking here. 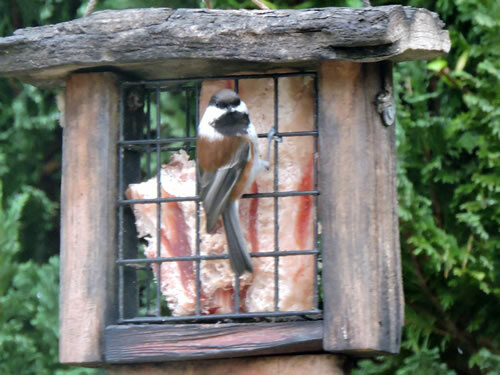 One or two pieces of suet from the butchers is a great addition to your birds' pantry. 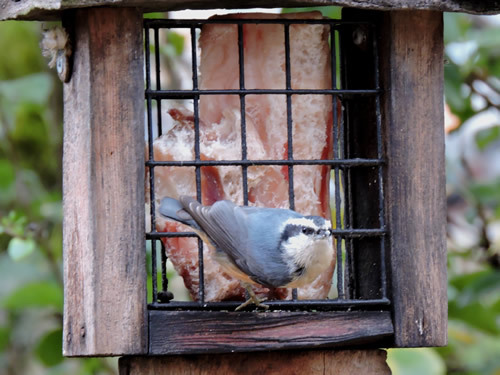 Slip them into a suet cage, many birds will enjoy this treat through the winter months. 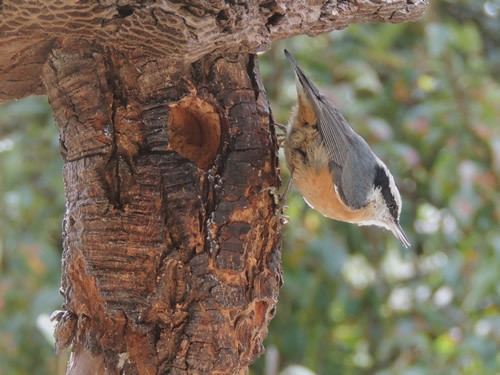 A nuthatch calls in for a little snack. 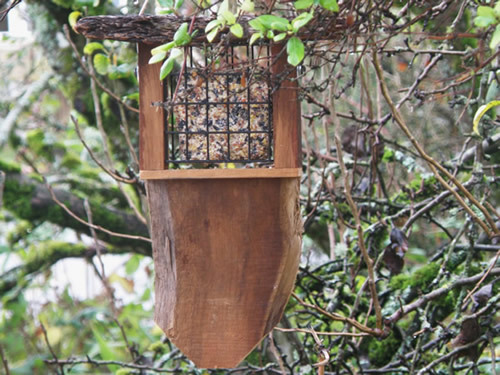 You can find out how to make this feeder here. 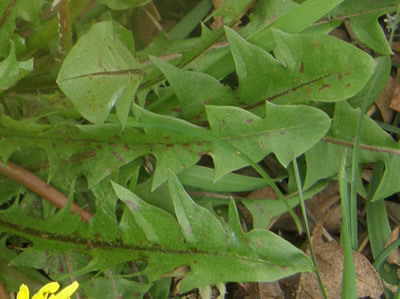 Did you know that the dandelion got its name because of its leaves? 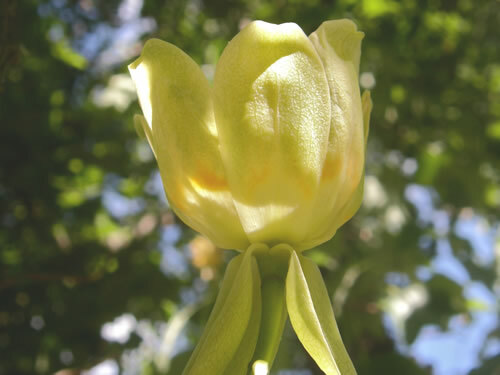 It was given the name because of the plant's jagged leaf shape. 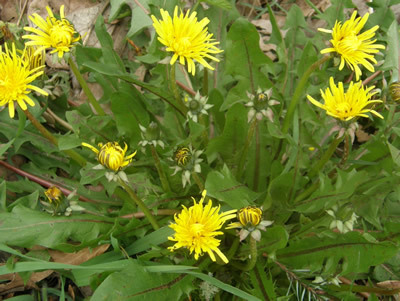 It was called dent de lion (tooth of the lion) which became Dandelion. 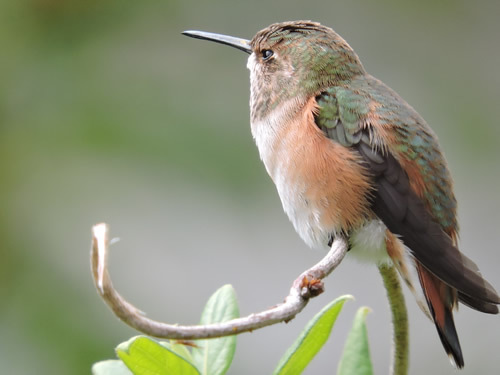 An easy one this month: it's a handsome male Rufous Hummingbird.